Hip Candy : Serena Williams Wins Olympic GOLD. Serena Williams Wins Olympic GOLD. via Essence: Serena Williams has just made Olympic history at Wimbledon this morning, earning her first Olympics singles gold medal. After going up against Maria Sharapova in the women’s Tennis finals, Williams dominated the game finishing off her formidable opponent with a winning score of 6-0, 6-1. Williams served three aces in the opening game and broke Sharapova’s service in the second. It was a huge win for Williams, who by taking home the gold medal, earned a career Golden Slam. She’s only the second woman in history to do so. 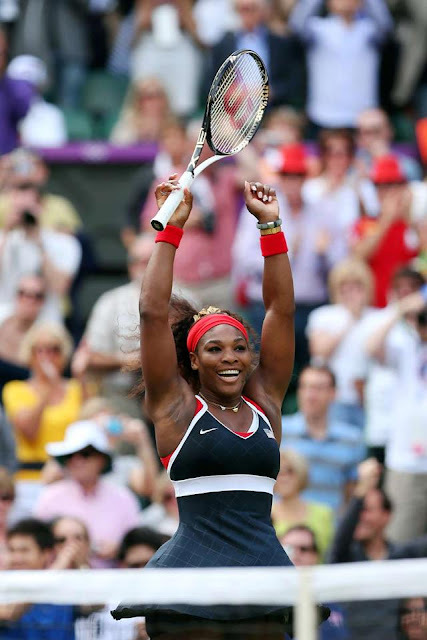 Williams can add the gold medal to her 14 Grand Slam singles championships, the most of any active woman. Since she lost to Sharapova at the Wimbledon final in 2004, Williams has now beaten her a whopping eight consecutive times.